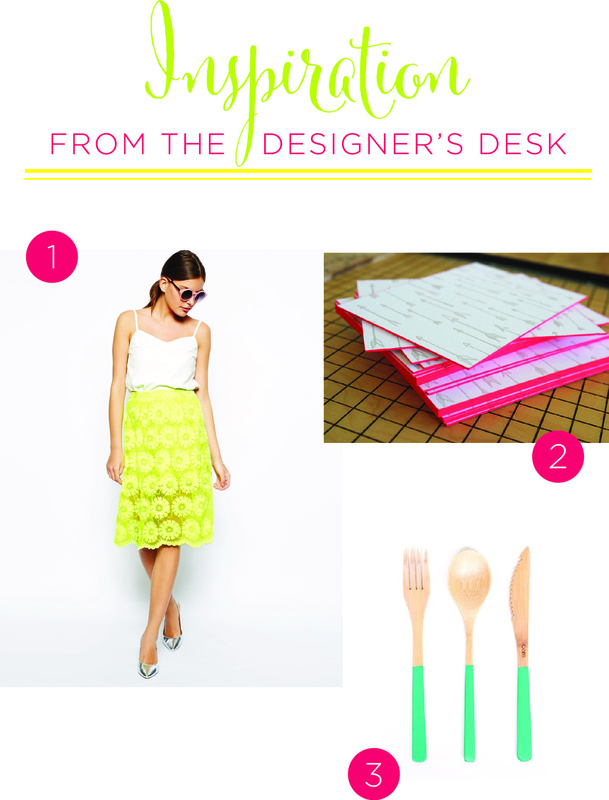 From the Designer's Desk: NEON! As a designer, my aesthetic for paper and print items is constantly being informed by seasons, feelings, what I ate in the morning, etc. This is our goal as an artist; To take in, synthesize, our external world and reimagine it into something that we created. A concept that I hold dear. Recently, I have been inspired by so many things. But this week (maybe this month......even this year??! ), I have come to adore pops of neon!! Neon comes from a Greek wording meaning "new". It is a gas that was discovered in 1898 as one of three residual rare inert elements remaining in dry air (after nitrogen, oxygen, argon and carbon dioxide are removed) . Neon was the second of three rare gases to be discovered and was immediately recognized as a new element from its bright red emission spectrum. We get our fantastic bright neon colors based on the emissions spectrum. I love that this is such a small way that science has been incorporated into design, fashion, and art.